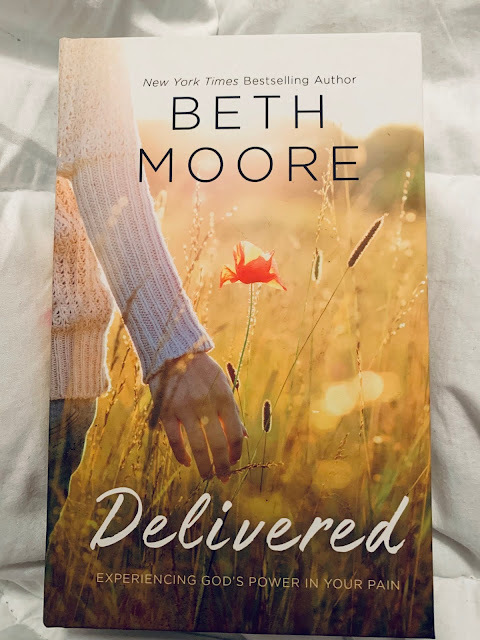 Based on her bestselling book, Get Out of That Pit, Beth Moore delivers a stirring message of sheer hope, utter deliverance, and glorious freedom of God. God is in the deliverance business. He longs for you to be free, to know the love and presence that are better than life—and the power of His Word that defies all darkness. In Delivered, Beth Moore shares her own journey out of the pit and the way the poetic expressions of Psalm 40 rewarded her with a new song for her soul—given by her Savior and offered to you here in this soul-stirring book. You also can be free from the worst life has to offer and learn to take Christ’s mighty arm when he reaches into the depths, and says in a way you can finally hear, Need a hand? My Thoughts: First of all I have to start by saying that I did receive this book so that I could review it, but that doesn't change my opinion in any way. When I received this book, I was surprised by it's small size, although I did appreciate that it is a hardback. For such a small book though, there's a lot of information. Beth Moore really opens up and offers her life experiences on the pages. Blamed for her husband’s death, Cordelia Greythorne fled Cornwall and accepted a governess position to begin a new life. Years later her employer’s unexpected death and his last request for her to watch over his five children force her to reevaluate. She can’t abandon the children now that they’ve lost both parents, but their new guardian lives at the timeworn Penwythe Hall . . . back on the Cornish coast she’s tried desperately to forget. Jac Twethewey is determined to revive Penwythe Hall’s once-flourishing apple orchards, and he’ll stop at nothing to see his struggling estate profitable again. He hasn’t heard from his brother in years, so when his nieces, nephews, and their governess arrive unannounced, he battles both grief at his brother’s death and bewilderment over this sudden responsibility. 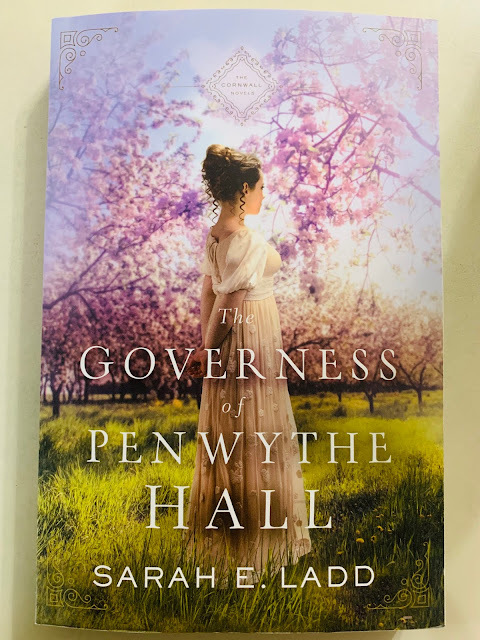 Jac’s priorities shift as the children take up residence in the ancient halls, but their secretive governess—and the mystery shrouding her past—proves to be a disruption to his carefully laid plans. Rich with family secrets, lingering danger, and the captivating allure of new love, this first book in the Cornwall series introduces us to the Twethewey family and their search for peace, justice, and love on the Cornish coast. My Thoughts: I have to start with saying that while this book was given to me so that I could review it, that doesn't change my opinion of it at all. This is a slow paced, calm book, with a slow burning romance, perfect for relaxing. It's sweet and wholesome, which I really like for younger (teen) readers and it really pulled me in. While it isn't the most exciting romance novel, I really enjoyed reading it. 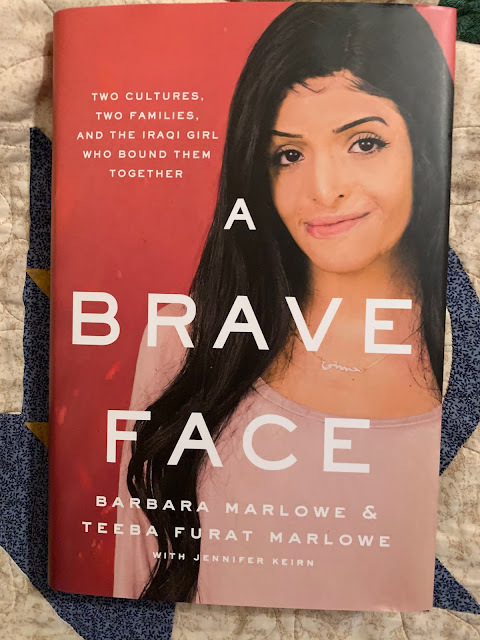 The inspirational story of a woman who moved mountains to provide medical care for an Iraqi girl badly burned during a roadside attack, Barbara Marlowe’s determination to fight for her future daughter highlights the way love can reach across both cultures and continents. Barbara Marlowe was in her fifties when she saw the photo that changed her life. It was a photo of four-year-old Teeba Furat Fadhil, whose face, head, and hands had been severely burned during a roadside bombing in the Diyala Province of Iraq when she was just nineteen months old. It was Teeba’s eyes that captivated Barbara. They were wide, dark, and soulful. They seemed to cry out with a message across continents: Help me. The story of Barbara responding to that call is as inspiring as it is improbable. With a powerful faith and determination, Barbara overcame obstacle after obstacle to bring Teeba to the United States for medical treatments—and to ultimately offer a home. A Brave Face includes material written by Teeba and her Iraqi mother, Dunia, at key moments in their stories. The book also explores the connection forged between Barbara and Dunia over the past decade—a connection that has survived the strife of war and the horrors of Al-Qaeda and ISIS. In the end, this story highlights the power of love to reach across both cultures and continents. My Thoughts: I have to start by saying that I did receive this book so I could review it but that doesn't change my opening of it in any way. I hadn't heard of this story before being offered it, but was interested when I learned a little about it. It's heartbreaking and then heartwarming. It follows a few different stories that intermingle and it fits together so well. Great read. When three people take the wrong suitcase from baggage claim, their lives change forever. When David, Gillian, and Michael each take the wrong suitcase from baggage claim, the airline directs them to retrieve their bags at a mysterious facility in a deserted part of the city. 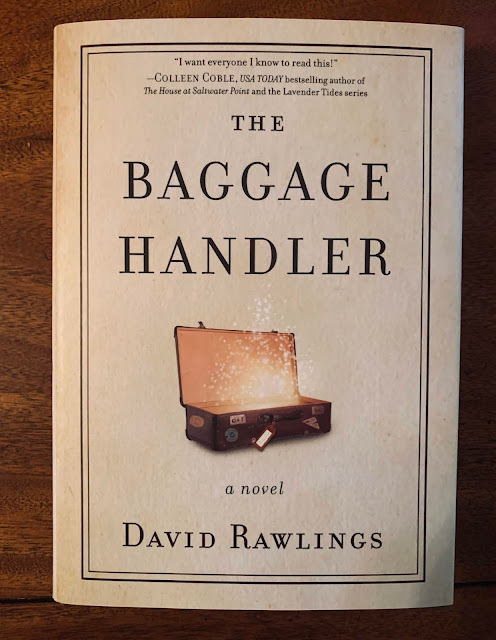 There they meet the enigmatic Baggage Handler, who shows them there is more in their baggage than what they have packed, and carrying it with them is slowing them down in ways they can’t imagine. And they must deal with it before they can leave. I have to start by saying WOW. I did receive a copy of this book to review it but, I had blindly picked it and had no idea what the story would be able. I began reading and was immediately absorbed into the story, and the more I read the more I liked it. The story, while intricate falls together so well. The meaning just behind the surface is powerful and yet the book is still very enjoyable. More than ever, politics seems driven by conflict and anger. People sitting together in pews every Sunday have started to feel like strangers, loved ones at the dinner table like enemies. Toxic political dialogue, hate-filled rants on social media, and agenda-driven news stories have become the new norm. It’s exhausting, and it’s too much. Sarah from the left and Beth from the right invite those looking for something better than the status quo to pull up a chair and listen to the principles, insights, and practical tools they have learned hosting their fast-growing podcast Pantsuit Politics. As impossible as it might seem, people from opposing political perspectives truly can have calm, grace-­filled conversations with one another—by putting relationship before policy and understanding before argument. My Thoughts: I am so happy that I was able to read this book, and getting it from the publisher to do so doesn't effect my review in any way. I actually hadn't heard of these women but was immediately interested when I saw the title. I didn't even realize that it was political! 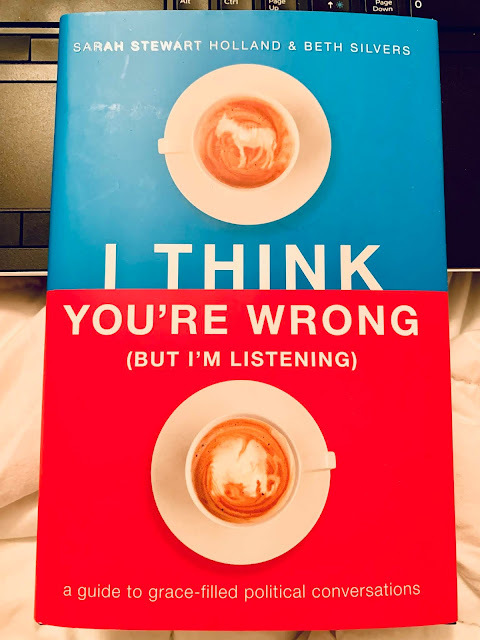 It's a great guide book for more than productive political conversations. It really goes into how to examine yourself and your own motives. A great book for self reflection.